Muammar Gaddafi today dismissed as lies reports he had fled to Niger, as the central bank said the fugitive ex-leader had sold more than 20 per cent of the country’s gold in his regime’s dying days. With remnants of Gaddafi’s battered forces pinned down, Libya’s new leadership and the US called on neighbouring countries to close their borders to Gaddafi stalwarts. Hosni Mubarak was back in court on Thursday over the killing of protesters, a day after the judge summoned Egypt's military ruler and other top officials to testify next week in the trial of the former president. U.S. President Barack Obama will lay out a jobs package worth more than $300 billon on Thursday, staking his re-election hopes on a call for urgent bipartisan action to revive the faltering American economy. Three Indians were killed while 10 others were rescued when a Liberian-flagged ship with 15 sailors onboard exploded off Nigeria’s territorial waters. The three were confirmed dead while two persons were reported missing after tragedy struck the ship, ITB Jacksonville, near Apapa port in Nigerian city of Lagos on Sunday. Muammar Gaddafi today dismissed as lies reports he had fled to Niger, as the central bank said the fugitive ex-leader had sold more than 20 per cent of the country’s gold in his regime’s dying days. With remnants of Gaddafi’s battered forces pinned down, Libya’s new leadership and the US called on neighbouring countries to close their borders to Gaddafi stalwarts. 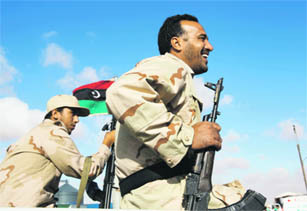 At least 30,000 persons were killed and 50,000 hurt in Libya's six-month civil war, interim health minister Naji Barakat said, offering the first detailed estimate of casualties in bringing down Muammar Gaddafi. At least 4,000 are still missing. Libya has a population of just over 6 million. Gaddafi also said NATO, which has been carrying out daily air raids against his forces under a UN mandate since March 31, “will be defeated” as its “logistical capacities will not allow it” to press on. ”We are ready in Tripoli and everywhere to intensify attacks against the rats, the mercenaries, who are a pack of dogs,” he said. Since his Tripoli headquarters was overrun on August 23, Gaddafi has made several appeals for resistance in tapes aired by Arrai, which is run by former Iraqi Sunni MP Mishan al-Juburi. Juburi, the only media personality able to contact Gaddafi since he went into hiding after forces of the National Transitional Council (NTC) took Tripoli, said the ex-leader and his son Seif al-Islam were still in Libya. “I can tell you that I spoke with Gaddafi very recently,” Juburi told AFP. “He is in Libya, in very good spirits, feels strong, is not afraid, and would be happy to die fighting against the occupiers,” Juburi said by phone. “His son Seif al-Islam is in the same state of mind,” added Juburi, whose channel has broadcast a number of audio messages from the Gaddafis. The NTC fears Gaddafi will try to slip over one of Libya's borders, and Niger strongly denied he was in the country after a convoy carrying other senior ousted regime officials fled there on Monday. The US stated Gaddafi was not believed to be among them. In a bid to cut off Gaddafi’s potential escape routes, the NTC said it had dispatched a team to the Niger capital Niamey, and the United States said Gaddafi aides who entered Niger were being detained. None of those crossing into Niger earlier this week appeared to be on a list of persons subject to United Nations sanctions, said State Department spokeswoman Victoria Nuland. Niger Foreign Minister Mohammed Bazoum, attending a conference in Algiers, said neither Gaddafi nor any other wanted fugitives had arrived in his country. Meanwhile, Libya’s central bank governor claimed Gaddafi had sold a large chunk of the country’s gold reserves in the dying days of his regime. The testimonies of such high-ranking officials could prove decisive in the case, although Judge Ahmed Refaat said when he announced the decision on Wednesday that the witnesses would be heard behind closed doors for reasons of national security. The judge surprised the court by saying Field Marshal Mohamed Hussein Tantawi, who heads the military council now ruling Egypt and served as Mubarak's defence minister for two decades, would appear in the witness box on Sunday. Armed Forces Chief of Staff Sami Enan and Omar Suleiman, Mubarak's former intelligence chief and briefly his vice-president, will also testify next week, alongside Interior Minister Essam el-Essawy and his predecessor Mahmoud Wagdy. Adel, an activist with the April 6 movement which helped lead the anti-Mubarak uprising. "We have to see it, and the concept of a publishing ban and secrecy is totally rejected by us," he added. The court convened on Thursday to hear more witnesses after police officers suggested to the court earlier this week that neither Mubarak nor his former Interior Minister Habib al-Adli, who is also in the dock, had ordered police to shoot. Lawyers for some of the 850 people killed in the revolt that ousted Mubarak on February 11 have been irked by police statements, saying officers changed their accounts when they were in court. But the judge dismissed a prosecution bid to raise a case against one witness for alleged false testimony. 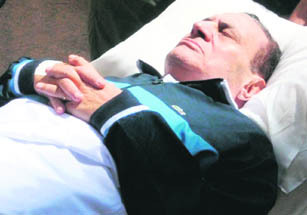 As in the four previous sessions since the trial started on August 3, Mubarak was flown to the court by helicopter and wheeled into the courtroom on a stretcher. The 83-year-old has been hospitalised since April when he was first questioned. Mubarak is charged with conspiring to kill protesters and "inciting" some police officers to use live ammunition, as well as with corruption. He has denied all charges. With his poll numbers at new lows amid voter frustration with 9.1 percent unemployment, Obama will make tax cuts for middle-class households and businesses the centerpiece of the plan and will press for new spending to repair roads, bridges and other deteriorating infrastructure. He will use his televised speech before a joint session of the U.S. Congress, at 7 p.m. EDT (2300 GMT), to urge passage of his “American Jobs Act” by year-end. “It’s time for Congress, after a five-week vacation, to come back and do something and not just say ‘no’ to everything that gets proposed in this town,” Daley said on CBS. Three Indians were killed while 10 others were rescued when a Liberian-flagged ship with 15 sailors onboard exploded off Nigeria’s territorial waters. The three were confirmed dead while two persons were reported missing after tragedy struck the ship, ITB Jacksonville, near Apapa port in Nigerian city of Lagos on Sunday. Ten persons, all of them Indians, were rescued after the incident and taken to a hospital for emergency medical attention. “All the rescued persons were Indians. They were taken to a search and rescue hospital in Apapa port in Lagos,” a spokesperson for the Nigerian Maritime Administration (NIMASA), Lami Tumaka, told PTI. Three bodies were later recovered but two are still missing. NIMASA is the body responsible for rescue operations on Nigeria’s territorial waters. it approached Nigeria’s commercial capital of Lagos. After having successfully managed to get sexual assault charges dropped against Dominique Strauss-Kahn, lawyers for the former IMF chief are now seeking additional time to prepare for his defence in a civil lawsuit filed against him by his accuser hotel maid.